The Ga Traditional Council says it was never consulted by anybody before the Greater Accra Coordinating Council released a circular purporting to restrict this year’s Homowo celebration of the Chiefs and people of Ga.
“Even in areas where there are shootings and bloodshed the people celebrate their annual festivals without interference whatsoever,” the release said. It will be recalled that on Monday August 9, 2010 the Greater Accra Regional Coordinating Council issued a circular restricting the forthcoming annual Homowo festival to designated areas. The restriction was contained in a press statement signed by Fats Nartey, Chief Director of the Regional Coordinating Council on behalf of the Greater Accra Regional Minister. The Regional minister has directed that the festival be restricted to only family homes where there are no disputes. The sprinkling of “Kpoikpoi” the directive went on should also be done in such family homes and not extended unto the streets at the trouble spots. Persons the minister referred to as malcontents should not be allowed into any of the palaces or the stool rooms. 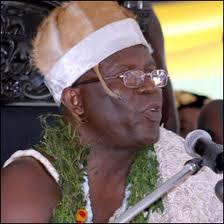 The annual festival has been marred with what has been described by interference of people with vested interests in the Ga chieftaincy affair.